Feedback on my set-up? Seahorses arriving Tuesday! I just wanted to share photos of my set-up and see if anyone has any feedback. Its a 30 gallon cube (20"W x 18"D x 20"H) and I turned it into a DIY AIO. 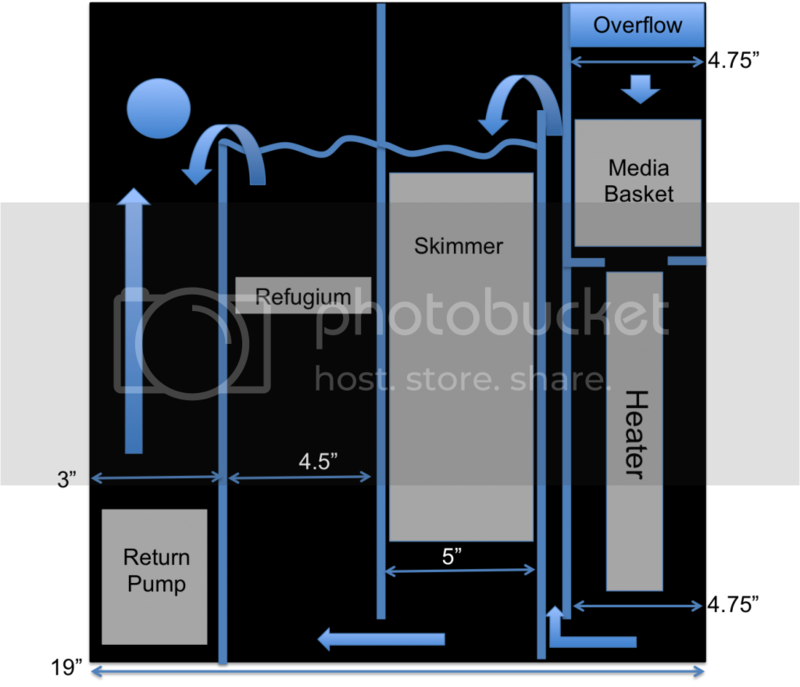 The back chambers contain the filter media, the heater, the skimmer, a refugium, and the return pump. Here are some photos. 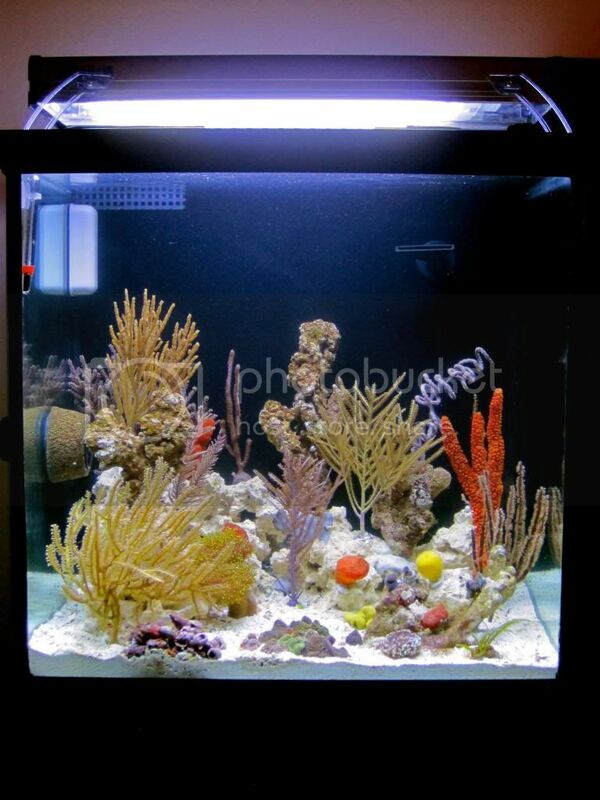 I will be adding macro algaes and some more soft corals later this coming week. Don't be too disappointed when they change colors, one of mine was bright yellow when shipped, and now she's cream colored. Wow! That looks awesome! Where did you get the yellow gorgonians? nice tank! plz keep us posted...with lots of pics of course! Thank you! I'm glad you like the tank! So far they are staying nice and brightly colored. They faded a bit during shipping but once I put them in the tank they colored back up nicely. Thank you! The yellow gorgonians are all from KP Aquatics (sealifeinc.net). Thank you! I definitely will post more photos. Here are some of my two new seahorses in the tank. Adorable! Good luck with them! Oh, I forgot to tell you, I would think about attaching those ricordeas to the rocks. 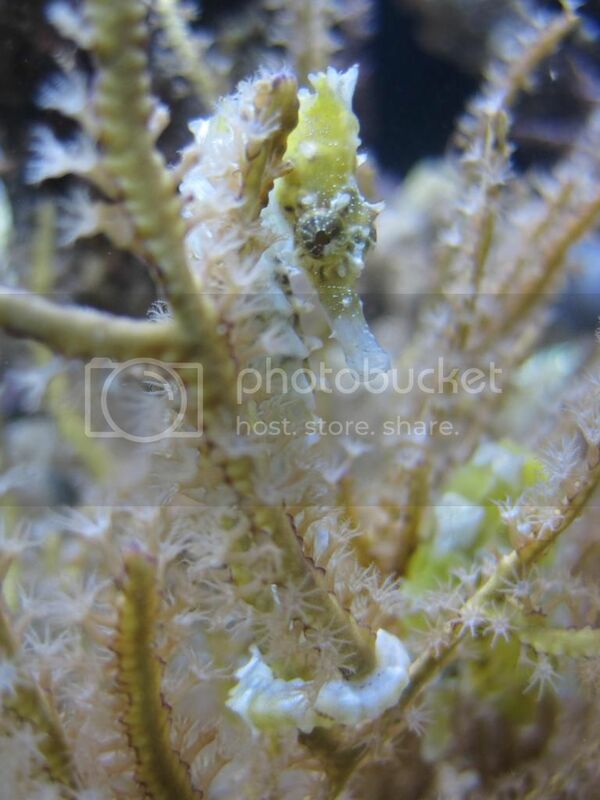 White liverock has a tendency to turn dark brown/gray and the seahorses tend to change the colors of the rock. I've found that when I get my liverock completely covered in coral, the seahorses turn/stay much brighter colors. 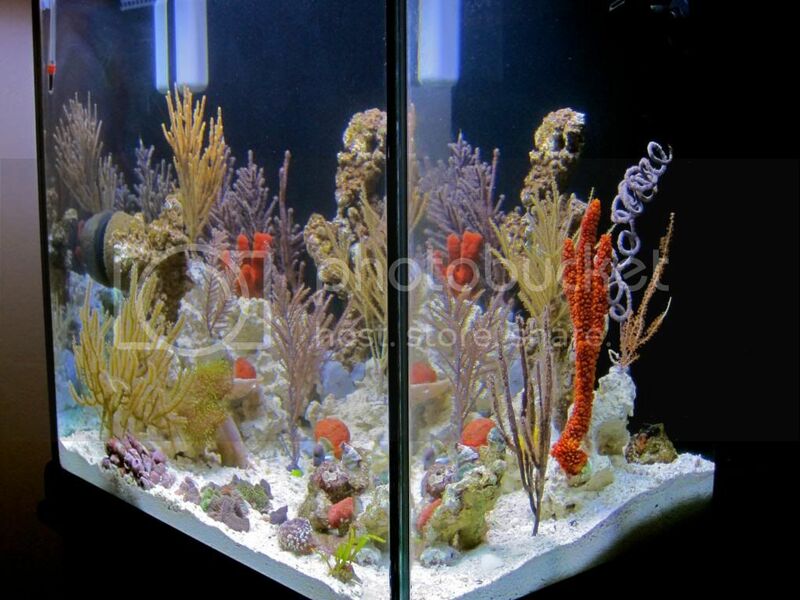 Beautiful tank setup and of course the pretty seahorses. do you have some pics of your DIY AIO? would like to see what/ how you did it. Thank you everyone! So far they are doing very well and have settled nicely into their new home. They're also eating great! Good thought! I actually added some macros over the weekend to fill in the blank spaces on the rocks. I also have some more softies in my main tank that I need to frag to put in the new tank, so hopefully soon most of the rocks will be covered. Very good advice! You shouldn't have any need for that heater as target range temperature wise for the seahorses should be 68° to 74°F. Where I live the weather is very mild and the temperature is between 50 and 75 F pretty much year round. I leave my windows open at night when its in the 50's outside, so I need the heater to keep the temperature stable at night. The tank is running at a constant 73 F with the heater. I am teaming with jealousy! Good luck, absolutely beautiful set up and horses! Sure! 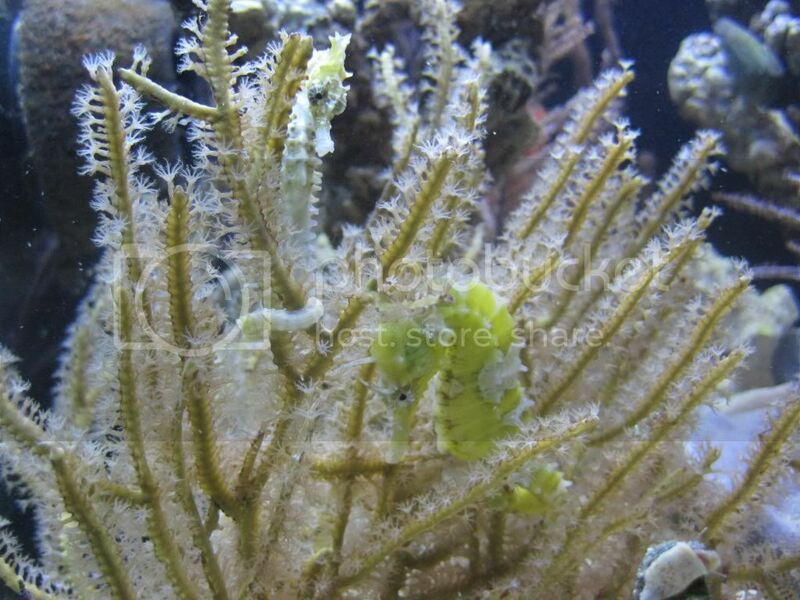 Here's a video of the seahorses eating. Great video! Happy to see em eating and smoking! how active would yu say they are? hicking 90+ % of the time or more or less? loving your set do the SH bother the gorgs? what was your experience with KP aquatics? is that big reg gorg a knobby sea rod? how is every thing doing? what are you feeding them? Thanks! They didn't eat for a bit after shipping, which I was warned about by the breeder but was still stressful. It was such a relief to have them start eating! I feed them like I did in that video twice a day and I let them both eat until they are full. So far they seem super healthy and happy! Yeah, they're not super active. They spend most of their times hitched and then they'll swim to a new hitch and hang out again. They do spend time moving around on the hitch hunting copepods and just kind of checking everything out. If I stick my hands in the tank to do work they get more active and the smaller on will swim up and hitch on my fingers. They also get more active at feeding time and for a while at night right before the lights go out. The seahorses don't seem to both the gorgonians much at all. Most of them are already used to the hitching and don't even close their polyps when the seahorses hitch to them. I've only got one (a purple ribbon gorg) that hasn't been doing very well. It still looks healthy but doesn't have its polyps out very often because it closes them whenever a seahorses hitches to it. Other than that one though, they don't both anything else. I love KP Aquatics. I've ordered from them 4 times now and I do not have a single complaint. They have great stuff for very reasonable prices. Their "standard" sized gorgonians are nice and big for the price. I placed a very large order for this tank, including a mated pair of jawfish, gorgonians, sponges, starfish, hermits, and snails, and I didn't have a single casualty. Everything arrived healthy and I was impressed with the size and quality of everything. Also, they always throw in freebies! I got 10 freebies with the big order for this tank including a free gorgonian, 2 free sponges, a free starfish, and some extra snails and hermits. I HIGHLY recommend KPA! The big red thing is actually a red tree sponge from KP Aquatics. Everything is doing very well! 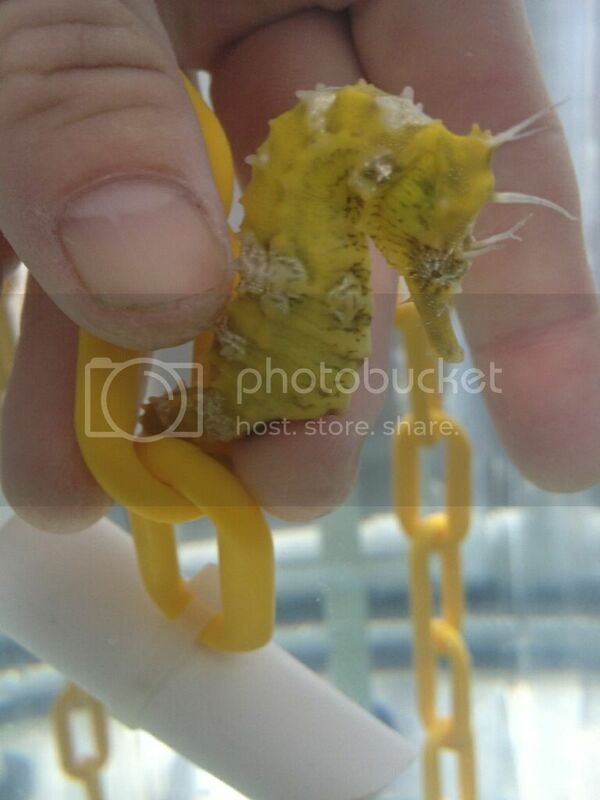 I'm feeding the seahorses PE mysis twice a day. For the morning feeding, I thaw the shrimp and let it soak in VitaChem overnight. For the evening feeding, I just feed the thawed shrimp with no enrichment. 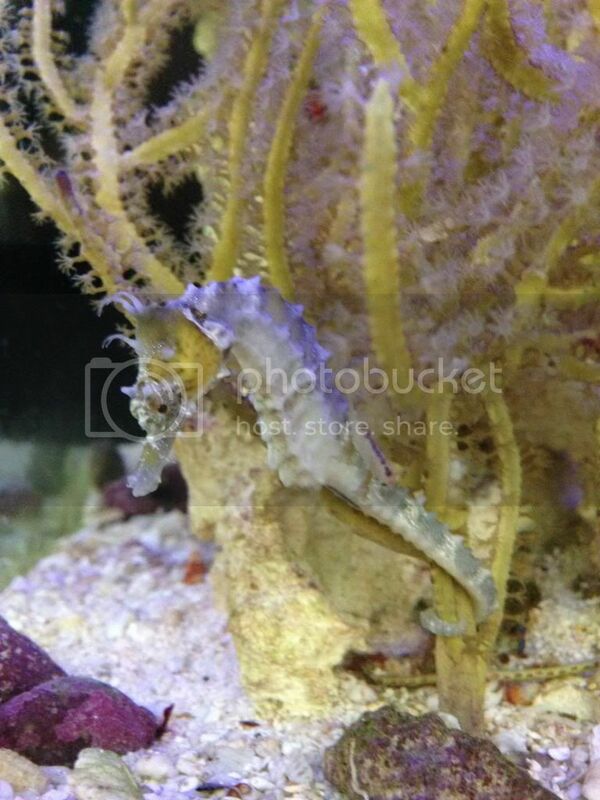 I just received my third seahorse from Southwatch Seahorse Farm! She's gorgeous and arrived safe and sound this morning. 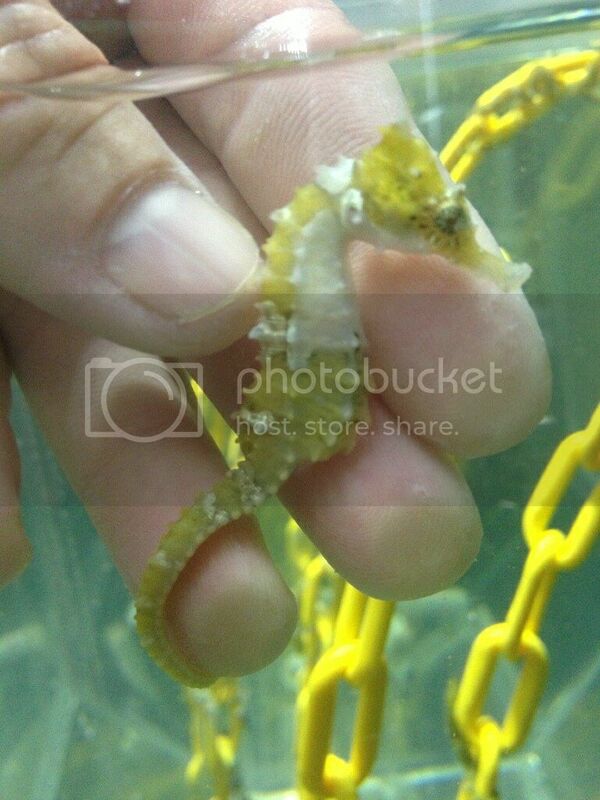 I highly recommend Southwatch Seahorse Farm for anyone looking for nicely colored and healthy captive bred H. Erectus. Their prices are very reasonable, and include free shipping. 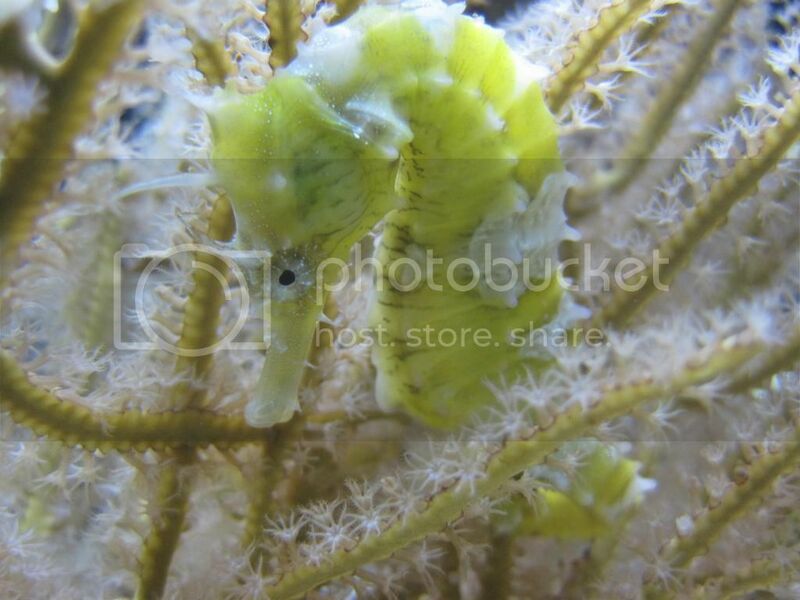 Jon (the owner) is very helpful and is great about answering questions and sending photos to let you pick out your seahorses. They breed for nice coloring and patterns and so far my seahorses have stayed the colors they were in the photos when I picked them out. They definitely do a great job breeding for seahorses that will maintain their bright coloring. Mine will change shades a bit within the yellow range, but they have yet to turn brown/black/grey or any other drastic color change. Anyways, here's my newest seahorse! a couple Qs, how are the seahorses doing with the MP10 ? any Issues ? do you have it at 100% ? how are you feeding the gorgonians and sponges ? some of them, like the yellow one seem to be none Photosynthetic ? tank and horses look amazing, congrats. The seahorses actually really enjoy the flow. I just made sure to set it up so there are calmer spots they can hang out in, but they also like to hang out in the high flow areas part of the time as well. I do not have the MP10 on 100%. Its probably running around 50% most of the time although I turned it down to like 25% today to let the new seahorse get settled in. I just ALWAYS have the foam guard in place on the MP10 to make sure that the seahorses cannot get their snout or tails into the propeller. I put it into feed mode when I feed them and that is low enough flow for them to maneuver after their food. All of my gorgonians are actually photosynthetic. However, the sponges and the spiral wire coral are NPS. I just feed some PhytoFeast every other day. I broadcast feed it by dropping some into the flow so that it gets dispersed all over the tank.